Discover your inner artist at a Painting in the Vineyard event! We invite you to grab a glass of wine and a paintbrush and join us for a fun and relaxing outdoor experience. Bring your friends and family and capture the scenery on canvas. Our local vineyards provide a beautiful, stress-free environment that will both inspire your creative spirit and indulge the wine-lover in you. 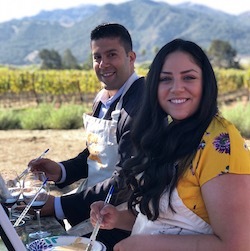 No painting experience necessary--a trained, local artist will walk you through the entire two-hour painting process step-by-step, and you'll take home a landscape painting of your own to commemorate your trip to wine country. Consider a painting event to celebrate birthdays, bachelorette parties, bridal showers, anniversaries, girls trips, family reunions, corporate team-building events and more. Visit www.gypsystudiosart.com/events to see our full array of Painting in the Vineyard classes. Or call 805.990.2105 to inquire about private events. Along with Painting in the Vineyard events that are already scheduled on our calendar, we host private events at local vineyards as well as your location.